progress on the regulation of carbon continue to wax and wane in a U.S.
Congress unable to make a decision. 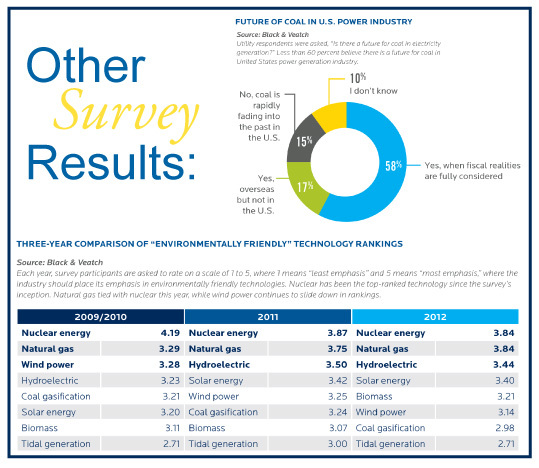 annual electric utility industry survey from February 22?March 23, 2012.
represented results have a 95% confidence level. additional insights into geographic differences. demise of the production tax credit are behind this uncertainty. national geologic storage facility at Yucca Mountain. that the survey’s timeframe in March pre-dated, and yet predicted, the U.S.
growth or declining kilowatt hour sales. formations have cut the cost of production nearly in half in the last 5 years. natural gas. However, few industry watchers expect prices will remain this low. 2020. In contrast, only 12% expect prices will be $8 per MMBtu or higher. water needed by other types of users. A report commissioned in 2009 by the U.S.
gallons of water for drilling and completion, including hydraulic fracturing. wastewater to disposal wells in Ohio generates a significant cost. access the more liquid Gulf Coast gas market. pipeline rate cases to redesign rates or establish new billing determinants. respondents indicated this will be the case for nuclear. from Black & Veatch. 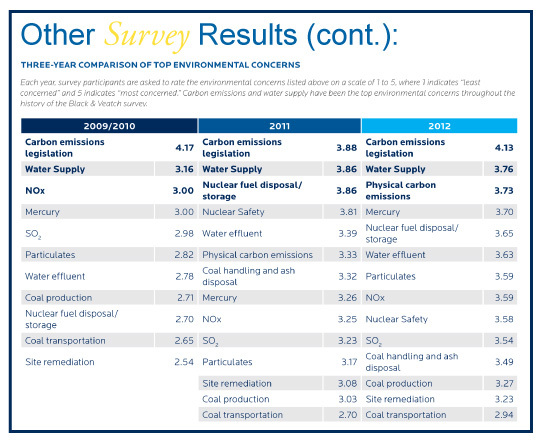 The full report is available at http://bv.com/docs/management-consulting-brochures/2012-electric-utility-report-web.pdf. Infrastructure? in Energy, Water, Telecommunications, and Government Services.